2009 showed a marked decrease in the volume of terrorist attacks compared to previous years, both in the Gaza Strip and in Judea and Samaria. The decline in the volume of terrorist attacks has led to a decline in the number of casualties: 15 killed – 9 of which during the “Cast Lead” operation (versus 36 last year) and 234 injured – out of which 185 were injured during the “Cast Lead” operation (versus 679 last tear). * In 2009 there is a marked decrease in the volume of terrorist attacks compared to previous years, both in the Gaza Strip and in Judea and Samaria. * In the Gaza Strip, the reason for the decline – the “Cast Lead” operation. Following the operation there was a marked decline in rocket launchings towards Israel; 556 launches (406 of which in January, most of them in the course of the operation) versus 2,048 last year. * In Judea and Samaria, the reason for the decline – mainly ongoing preventive activities of the Israeli security forces alongside activities carried out by the Palestinian security services. It should be noted that 90% of all the terrorist attacks in Judea and Samaria and in Jerusalem are events of Molotov cocktail throwing. * The decline in the volume of terrorist attacks has led to a decline in the number of casualties: 15 killed – 9 of which during the “Cast Lead” operation (versus 36 last year) and 234 injured – out of which 185 were injured during the “Cast Lead” operation (versus 679 last tear). * It should be noted that this year there were no suicide bombings. * Following the “Cast Lead” operation, Hamas’s activity in the Gaza Strip focused on the rehabilitation of the military force and in improving the tunnel system used for smuggling weapons and long range rockets. * Concurrently, dozens of attempts by terrorist organizations in the Strip to carry out attacks inside Israel using armed terrorist leaving the Gaza Strip to Sinai and from there into Israel, were foiled. * Furthermore, a widespread expansion of the global Jihad phenomenon is apparent in the Strip as well as the phenomenon of dozens of military activists joining various organizations founded in the Strip, inspired by global Jihad. * A continued effort by Hezbollah to execute retaliatory terrorist attacks following the death of Imad Mughniyeh, required appropriate deployment and a high level of alertness during the past year. * The arrest of terrorist Yaacov (Jack) Title and the exposure of a series of severe terrorist attacks he carried out over the past 12 years. * The continuation of the fight against terrorist funding; the retirement of Azzam Yousef, the operational manager of the Charity Coalition and of 7 welfare funds in Britain, including “Interpal” from the Coalition. 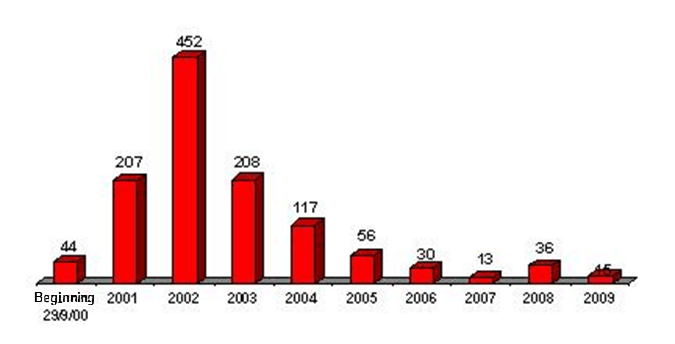 In the course of 2009, 15 people were killed versus 36 killed in the course of 2008. Most of the casualties – 9 were killed during the “Cast Lead” operation in January; 5 civilians and soldiers were killed as a result of steep trajectory shooting and 4 soldiers were killed as a result of bilateral shooting. At the end of January (27/01/09) a soldier was killed by an explosives charge at the Strip border. In addition 5 Israelis were killed – 2 members of the security forces were killed in a shooting in the Jordan Valley (March) and 3 civilians – 1 in a stabbing in Bat Ein (April), 1 in an attack in Ashdod (May) and 1 in a shooting near Shavey Shomron (December). In the course of the year, 234 people were injured versus 679 last year. Out of which 185 Israeli citizens and security forces personnel were injured in the course of the “Cast Lead” operation. Since the completion of the “Cast Lead” operation, Hamas is busy with building its military force and with other military preparations, in anticipation of another round of fighting, while hiding behind the back of the civilian population. The tunnel system used for smuggling weapons under the Philadelphi Route has been rehabilitated and upgraded. A large amount of weapons is smuggled in these tunnels on behalf of the Hamas and all of the terrorist organizations in the Strip. In addition, pipes and fertilizers are brought into the Strip used for the manufacturing systems of the various organizations, especially the Hamas, for the manufacturing of home-made rockets. The entire smuggling tunnel system in the Philadelphi Route and the merchandise passing through it is controlled by the Hamas security forces, constituting a significant source of income for the organization. Alongside the drastic decline in the number of rocket launchings towards Israel following the “Cast Lead” operation, the terrorist organizations maintain elevated motivation for carrying out terrorist attacks in Israel. In light of that, dozens of infiltration attempts by residents of the Gaza Strip, trying to enter Israel from the Strip to Sinai and from there to Israel, have been foiled. Amongst the infiltration attempts one can identify a heightened involvement of activists identifying with global Jihad ideology, trying to enter Israel from the Gaza Strip via Sinai for purposes of terrorism, such as Abd al-Rahman Talalka who was arrested in June, while trying to enter Israel from the Sinai, with the purpose of executing a terrorist attack in the heart of Israel to undermine the calm achieved after the “Cast Lead” operation. In the course of 2009 there has been extensive propagation of the “global Jihad” phenomenon across the Strip, in the scope of which dozens of military activists joined the various organizations founded in the Strip, inspired by “Global Jihad” (Jaljalat, Jund Ansar Allah etc). Over the year one saw attempts of these activists to execute terrorist attacks in Israel and on the border fence. Thus, for example, the activists are behind the terrorist attack on January 27th killing a soldier by an explosive device detonated near a patrol in the southern part of the Strip. Furthermore, they are responsible for the attempted attack that was foiled in June, in the course of which military activists galloped on horseback towards the Security Fence trying to kill and kidnap Israeli soldiers moving along the Fence. The attempted attack brought Hamas’s attention to the phenomenon threatening it and its rule over the Strip, and has heightened the tension between Hamas and the activists of the organizations identifying with global Jihad ideology, who did not accept its authority. The tension reached its peak in July when armed confrontations occurred between Hamas activists and the activists of these organizations, surrounding the mosque use by these organizations in the Rafah area. In the course of these conflicts many senior figures indentified with global Jihad, constituting the backbone of the leadership in these organizations, were killed and injured and many other activists were arrested. Furthermore, several Hamas activists were killed, the most senior serving as a regiment commander. However, the conflicts did not bring about the end of the activity of those identifying with global Jihad in the Strip. In 2009 the decline in the volume of terrorism in Judea, Samaria and Jerusalem continues. This year, 636 terrorist attacks were carried out in Judea, Samaria and Jerusalem (as of 24/12/09), versus 893 attacks in 2008, 946 attacks in 2007 and 1,309 attacks in 2006. The decline in attacks carried out with weapons such as shootings and explosive devices is prominent: 22 shootings in 2009 versus 83 attacks in 2008 and 13 attacks carried out with explosive devices versus 54 such attacks in 2008. Notwithstanding, some of the terrorist attacks in Judea, Samaria and Jerusalem are of a popular nature. Thus, out of 636 attacks carried out, 578 attacks – over 90%, were attacks via the throwing of Molotov cocktails. 2009 saw the continuation of the heightened preparation for the possibility that the Hezbollah will carry out retaliatory attacks following the death of Imad Mughniyeh. In addition, the organization’s attempts at recruiting activists for the building of terrorist infrastructures in Israel were evident, when senior figures are a preferred target. Thus, Rawi Sultani from Tira was arrested in August under the suspicion of gathering intelligence on the Chief of Staff – Lieutenant General Gaby Ashkenazi. In his interrogation, Sultani admitted that in addition to the information he passed on the Chief of Staff, he was asked by his handlers to gather information on other senior figures and on army bases in Israel. Ismail Saliman, a Bedouin from Hajajra in the Galilee, arrested February this year, was also suspected of being recruited by the Hezbollah. His interrogation revealed that he met in Saudi Arabia with a Lebanese Hezbollah handler who recruited him to the organization and who instructed him to gather intelligence on the IDF’s activities near his place of residence. The recruitment attempts also invaded the internet. In the course of the year, many reports were received on cases where terrorist entities approached Israelis on the internet, asking them to enlist for terrorist activities or to provide classified information for pay. 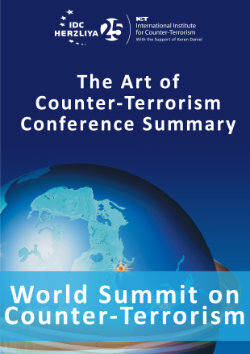 In 2009 several significant landmarks in the field of the fight against terrorist funding were achieved. On February 27th the “Charity Commission” in Britain (a committee in charge of the proper administration of non-profit organizations in Britain) published a report of its investigation of the “Interpal Fund” in Britain. As a result of the investigation the fund was required to disengage immediately from the “Charity Coalition”. Following the publication of the report findings, Azzam Yousef, a senior Hamas activist and one of the founders of the Charity Coalition who served as the Coalition’s operational manager, retired from the Coalition, as well as 7 welfare funds in Britain. Furthermore, heavy imprisonment sentences were given this year to Palestinians with U.S. citizenships who were convicted of funding terrorism through their activity at the “Sacred Land Fund” they headed; 65 years of incarceration to 2 of the fund’s heads, and sentences of 20 and 15 years incarceration to the other defendants.